Would you take a Zumba class with your significant other? The wife and I joined a gym. Goal: l was to be the motivator and get us both out of the house and to the gym. Plan: For me: Lift some heavy, macho stuff. For her: Join all the classes offered at the gym. Outcome: We both (unexpectedly) sign up for Zumba. Don't get me wrong. I can be about that life. Going to the gym, stretching, getting the heart pumping with a jog on the treadmill, and then hit the weights. Right? My wife had been going to Zumba religiously and only raved about how much fun the class was. She said the women were friendly and it was just like going dancing without having to get all dressed up. Dancing is fun, and by the way, that’s how I swept her off her feet. You can say I came out of the womb dancing. So... after some reservation and doubt, I finally walked into the studio. All I knew about Zumba was that it was created by a Colombian hombre. 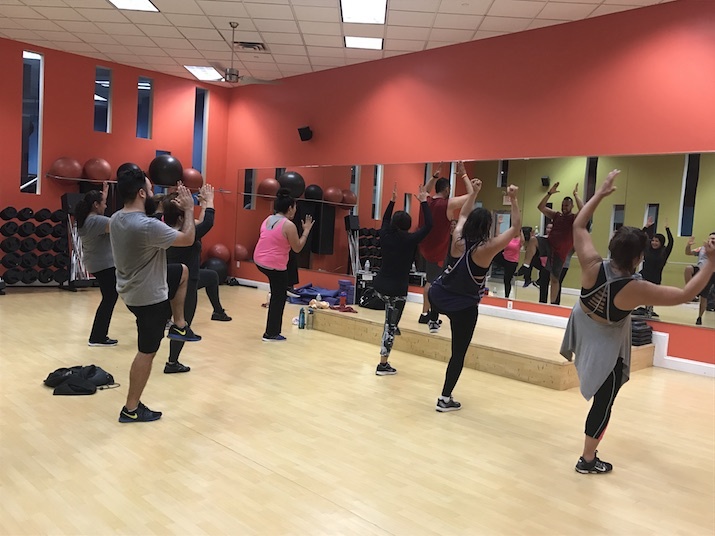 (I later found out it was Beto Perez), and it was a cardio workout to upbeat salsa, merengue, cumbia and Latin beats with the moves to match. Walking in was easy, but I didn’t know where exactly to go. So I did what any man would do and stood right next to my wife. The instructor walked in and pretty much just pressed play. Everyone in the class clearly had been there before, or perhaps they're professional backup dancers. The moves were easy and coordinated well with the music. It didn't take long to catch on and get into the counting mood - very similar to doing sets. After a few songs I was feeling good and had worked up a sweat. I did a quick time-check to see that it had been only 10 minutes. I was impressed. I never saw dancing as a workout, but the hip moves and the salsa steps from Zumba made it burn in areas reserved for leg day. The one-hour class came and went. I haven’t had this much fun or moved like that by running or with any other cardio workout. Zumba is a great way to update your gym routine as it can help tone your arms, chest and back. Why not pair your workout with some dance moves to burn a little more? I have been coming back and will continue to do so. Zumba is a fun way to get a workout with your loved one. The class is also welcoming; no need to fear or be intimidated. Everyone is there to move-it, move-it, just like in the club or back in the day at your tia’s house parties. Dale! Would you ever consider taking a zumba class with your significant other?